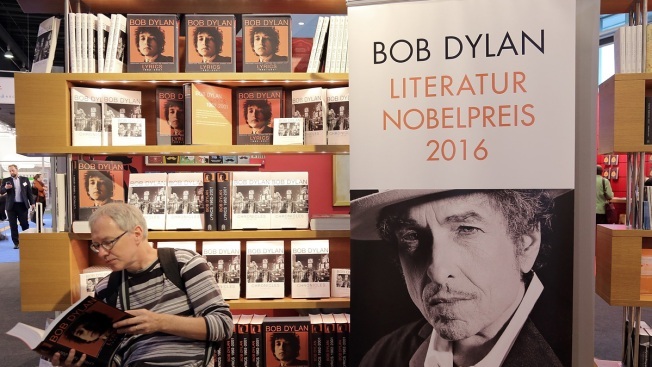 In this file photo, a man reads a book about Bob Dylan at the 2016 Frankfurt Book Fair on October 19, 2016 in Frankfurt am Main, Germany. It took Bob Dylan about a week to acknowledge the fact that he was awarded a Nobel Prize for literature. But it took him less than 24 hours after that to retract the recognition from his website. On a page of Dylan’s site promoting his book “The Lyrics: 1961-2012,” The Guardian reported Thurday it nonchalantly mentioned he was the “winner of the Nobel prize in literature” in a blurb describing the musician's success. That sentence was the most anyone had seen or heard from Dylan on the subject of his Nobel prize, which was announced last week. The Nobel academy’s permanent secretary Sara Danius has said that multiple attempts have been made to contact the singer/songwriter but to no avail. Dylan is the first musician to ever win this award. Widely regarded as the poet of the rock world, he is known his allusions and protest songs such as “Blowin’ in the Wind” and “The Times They Are a-Changin.’” He has published poetry and prose, also. Winning the Nobel for literature puts Dylan in the company of Gabriel Garcia Marquez, Toni Morrison and T.S. Eliot. Bob Dylan was given the honor for “having created new poetic expression within the great American song tradition,” according to the official Nobel prize website.